They say it looks like a duffle bag for a leprechaun. And funny enough, the Marmot Mini Hauler actually does. Until I read the description on the Marmot website, I hadn’t made the connection to how similar this shaving kit looks to a regularly sized duffle bag. Pretty funny. And pretty clever too. The Marmot Mini Hauler has the same construction, same handles and same visual cues as many of its much larger siblings. 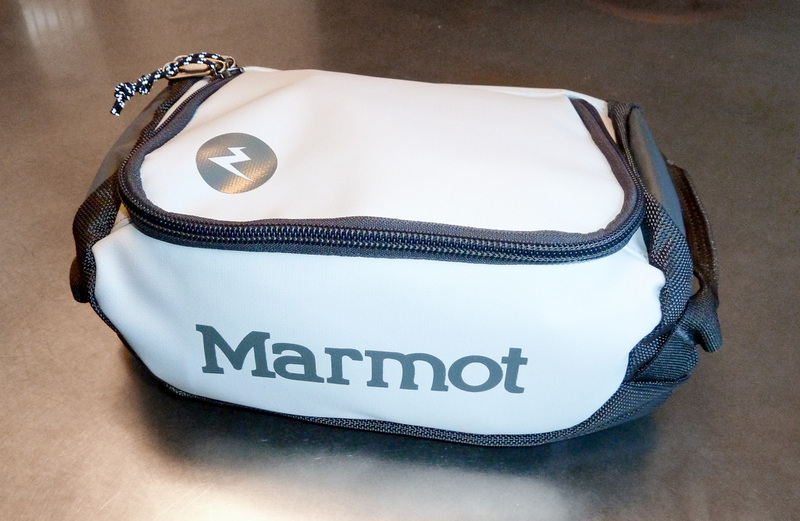 Styling aside, the Marmot delivers a very traditional shaving kit in the Mini Hauler. It’s one big open space for carrying just about everything you need on a lengthy jaunt away from home. About six liters of capacity for shampoo and vitamins, brushes and razors. The main pouch closes with a two-way zipper. Construction of the Marmot Mini Hauler is heavy duty. The main material is a TPE laminate (in other words, a water-resistant vinyl-like fabric) coupled with ballistic nylon along the sides. Inside the lid, Marmot locates a small plastic pocket that closes with a zipper. It’s perfect for flat items like bandaids and such. There’s also a long zippered nylon pocket along the rear of the Mini Hauler for holding additional bits of your travel kit. Over the years, we’ve used a range of new-age travel kits. Fancy, roll-up, multi-pocketed and doodad-emblazoned offerings that always seemed to fall short. They were too complex for their own good, too flimsy to stand up to the rigors of extended travel, and with hangers and other gewgaws that just got in the way. In contrast, the Marmot Mini Hauler has that old-school functionality I remember from Dad’s shaving kit. One wide-open space for carrying everything. Big, simple, just right. No fussy, over-thought features. Works like a champ as Dad would say. Big, simple, just right. No fussy, over-thought features. <em>Works like a champ</em> as Dad would say.